August 9, 2018, 2:25 PM · Welcome to "For the Record," Violinist.com's weekly roundup of new releases of recordings by violinists, violists, cellists and other classical musicians. We hope it helps you keep track of your favorite artists, as well as find some new ones to add to your listening! 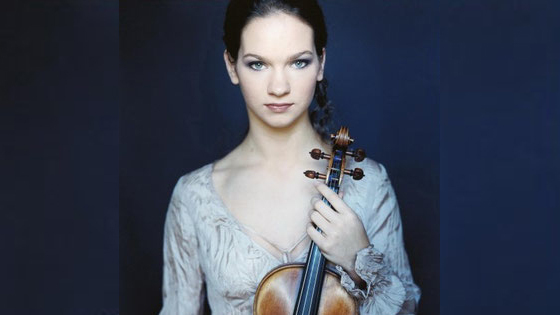 Hilary Hahn. Photo © Felix Broede, for Deutsche Grammophon. Attention vinyl lovers! Here Hilary Hahn’s first recording on Deutsche Grammophon of Bach Violin Concertos, available for the first time on vinyl. Originally released in 2003, the album was a triumph for Hahn, praised by Classics Today for "the chamber-like interplay that produces a more ‘authentic’ impression than many performances using period instruments." BELOW: Hilary Hahn plays the Bach Double with concertmaster Margaret Batjer and the Los Angeles Chamber Orchestra. Mark-Anthony Turnage Double Violin Concerto, "Shadow Walker," is dedicated to artist Mark Wallinger, and the title is drawn from a Wallinger video in which the artist films his shadow as he walks along Shaftesbury Avenue in London. The disembodied shadow takes on its own life in relation to the public on the streets. "The idea of shadowing can take many musical forms, such as through canonic writing and the imitation of intervals, though I haven't gone as far as composing a fugue," Turnage said. "The string sound of Vadim Repin and Daniel Hope should blend particularly well, almost like two aspects of the same identity. There isn't a strict hierarchical relationship with one violin the shadow of the other - it is much more equal and fluid." BELOW: An excerpt from the album. Comprised of three programs, Engage as a whole presents a body of work that has both defined and been shaped by Modney’s distinctly 21st century violin performance practice, exploring new technical and expressive frontiers on the instrument. The first program includes Sam Pluta’s Jem Altieri with a Ring Modulator Circuit, for violin and live electronics (2011); Taylor Brook’s Vocalise, for violin solo with drone (2009); Kate Soper’s Cipher, for soprano and violin (2011); and Anthony Braxton’s Composition No. 222 (1998). The second program pairs Modney’s adventurous interpretation of J.S. Bach’s Ciaccona (1720) in Just Intonation with Eric Wubbels’s “the children of fire come looking for fire”, for violin and prepared piano (2012). The final program features Josh Modney’s Violin Solos (2017). BELOW: From the album, "Vocalise" by Taylor Brook.